I know, when I buy my first flying bicycle, that I will plan a long cross country RideNFly. And while I’m on this RideNFly, I will get hungry, very hungry. I will want to be able to barbecue hamburgers, chicken, ribs, whatever, for myself and maybe 20-30 other people, just in case they show up, or I crash land in their neighborhood. 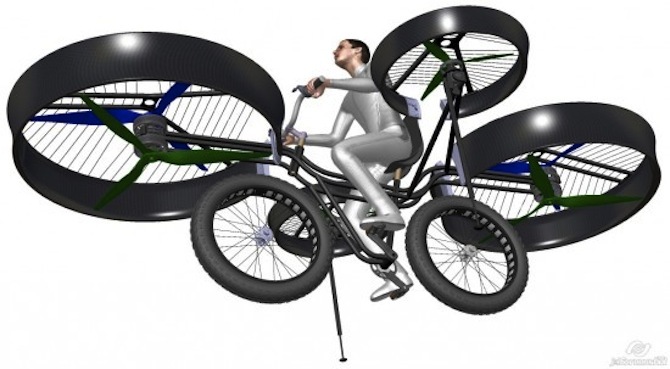 Until recently, I had no way to realize this dream, but thanks to a Czech company and their prototype flying bicycle, my RideNFly Barbecue Tour will soon become a reality. And I don’t even think the Czech guys realize their design is dual-functional. I can see it. Can you? Two large grills and two smaller ones for warming beans, cooking corn-on-the-cob, or sauteing some onions. Bare with me while I see this line of thinking through. Groundbreaking transportation tech is not always pretty. It’s not always comfortable. But I’ve noticed that it inevitably has a practical culinary use. The Wright Brothers biplane was not really designed for humans to fly. It was designed for a snake, on alligator, or something else used to lying on its stomach with it’s head looking straight out. But it’s long wings were perfect for drying fruit and freshly-washed lettuce, while flying. The first car – a steam-powered tricycle – was too tall, too bumpy, and had riders picking bugs out of their teeth do to the absence of a windshield. But it was steam-powered, so you could make tea. Most historians believe logs were the first boats. Log sailors often complained of splinters in their legs and posterior. And logs were unruly and tended to roll over a lot, dunking their passengers. But upon arrival, or at whatever point the trip was abandoned, log boats could be chopped up and used for fire in the preparation of a fine dinner. The first train powered by something other than humans was most likely a steam train, and it was just a boiler on wheels. Too hot to sit on, unless your Tony Robbins. But hot enough to barbecue on top of, which brings us full circle. Transportation and barbecue seem to go together. No wonder there are so many gasoline stations in Texas with their own barbecue restaurants. Speaking of a boiler, but not on wheels, my first elementary school had a huge iron incinerator in the middle of the playground. They used it to burn trash. It looked just like this train, standing upright. And it was hot too, as some of us found out when we put our hands on it. Why we did this, and why the school thought it wise to incinerate trash in a steam train turned on its end in the middle of the playground, I’ll never know. Thanks for reading my post, and be sure to pre-order your flying bicycle barbecue.